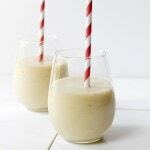 Mango Banana Smoothie – Wake up to this incredibly delicious and creamy Mango Banana Smoothie made with fresh mango, banana, honey and milk. Let’s do Smoothies for din din! I know. I’m serving something healthy. Again. Seriously, though… don’t you agree that we all needed to lay off the gooey S’mores Brownie Cookies and dive into the uber healthy Apple Avocado Salsa? Balance. It’s good for us. Supposedly. Oh! And I am not going to pretend like I didn’t notice. So I forgot to add one more word (banana) to the title on my photo. Sue me! (Don’t!) I mean, everyone messes up on the text that covers half of their photo. Everyone does it… Yes, they do! Suddenly I feel like I’m jumping on the Smoothie bandwagon, starting with that Diet Mixed Berry Smoothie, but that’s not entirely true. My blog jumped on it. I, on the other hand, have been on it for about 20 years. My dad, the guy that juices everything, taught me all I needed to know about smoothies and milkshakes and juices… My sister and I used to get a kick out of watching him blend, or sometimes juice everything in site. Peppers and strawberries, together. Oranges, bananas, and zucchini, yes, together. But, that’s how he does it, and we don’t judge. We just enjoy. Sometimes. Having said that, not only do smoothies satisfy my milkshake craving, but also my urge to play with the blender, just like my dad. 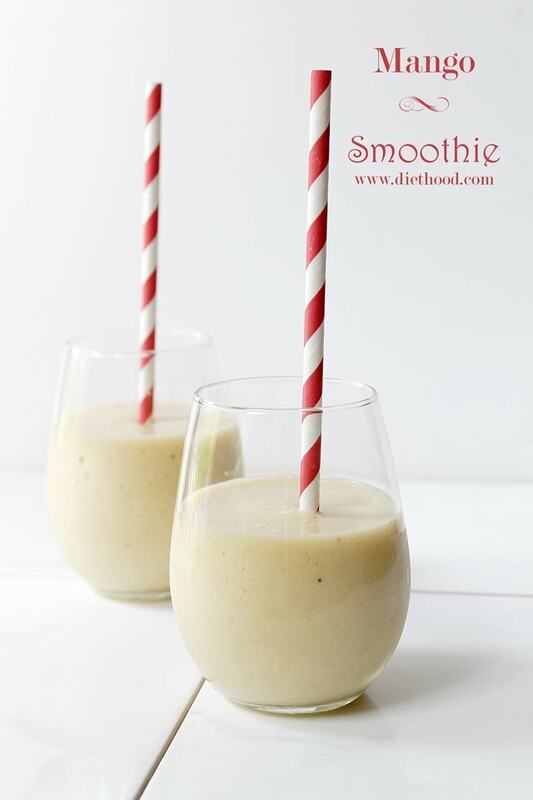 This particular Mango Banana Smoothie is a beautiful and fresh mix of mango and bananas, blended with honey and milk. It has been on my rotation this entire summer, especially these last few crazy-hot days. Give it a whirl, you may love it as much as we do. 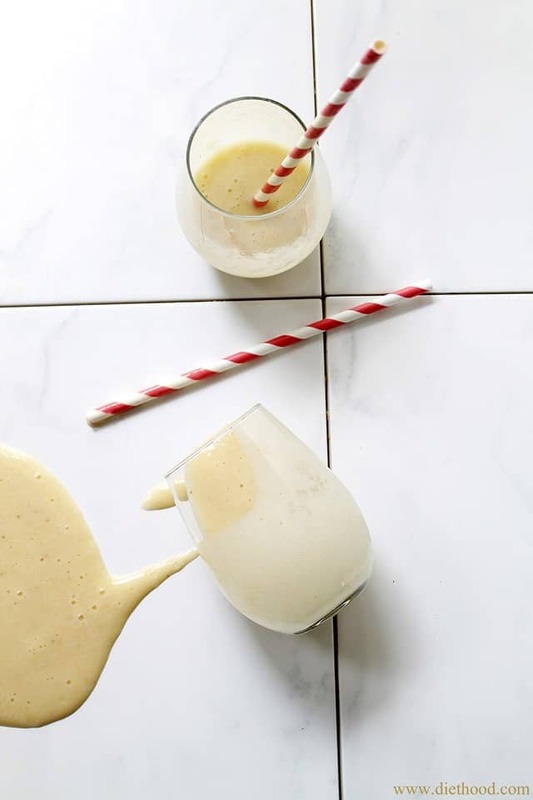 Wake up to this incredibly delicious and creamy Mango Banana Smoothie made with fresh mango, banana, honey and milk. Add more milk as necessary, depending on your desired consistency, and adjust sweetener to your taste. I loved this recipe. I’m definitely going to try it since I love bananas but I think I’ll use another non-dairy milk because I’m dairy intolerant. I’m always making recipes using fruit. 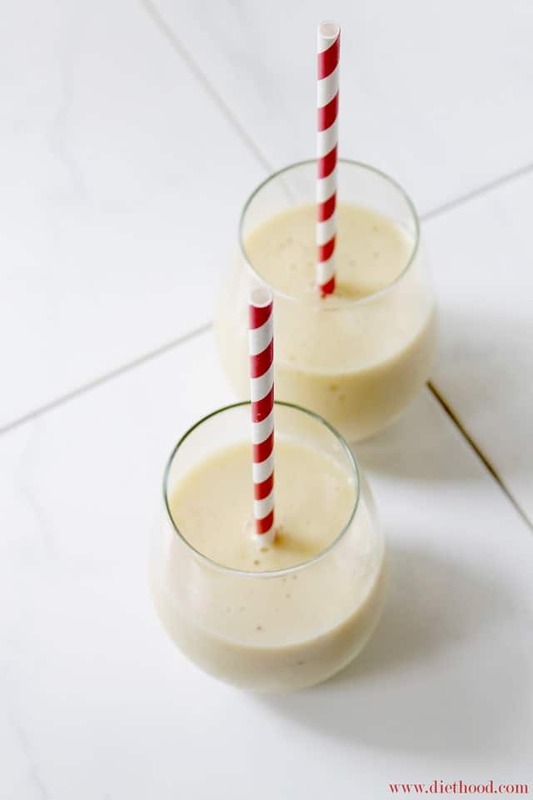 I was looking for a mango banana shake but I came across this smoothie recipe after reading few other simple similar recipes, but this attracted me more because of its more simplicity. I’m going to change few ingredients or add few more, such as vannila ice cream, elaichi for texture and smell, ice etc. Anyway, thank you. I’m going to now make it. Hi! Can I use frozen mango from the grocery store to make this & if so, how much of it should I use? Thanks! Hi Gina!! Is the mango diced? If it is, I would use somewhere around 1-1/2 to 2 cups of diced mango. I read this while drinking a mango margarita. Counts for something, right? I used the blender to make it . . . and thought about adding banana, but we’ve been having a fruit fly problem and I’ve deliberately avoided buying bananas long enough that I’ve even used all of the ones in the freezer! Thanks for a tasty smoothie idea! I love mangoes (have a whole case on my counter right now). Smoothies are the best with mangoes + bananas. I love a good milkshake, but these… oh my these would top my list any day! Mango smoothies are my favorite, this looks so refreshing! Looks so delish and lush. And Dads in the kitchen are THE best. Mine had a knack/addiction for cinnamon rolls. My hips would have preferred smoothies I think…. This is Liv’s version of the perfect lunch!! Yay for smoothies! I can’t get enough of them. I haven’t tried adding mango yet, but I know it must be very tasty! Sounds great for a morning treat! And I have totally done the same thing with my photos before! Love the food styling, but I totally said, “You spilled your smoothie!” Ha! Creamy smoothie with mango in it! I’m all over that! I’m always looking for healthy snacks to get me over that mid-afternoon snacking/bingeing 🙂 hump. This would definitely do the trick. Smoothies are Dudette’s go-to breakfast. I love it when she wants one because it makes me think that some kind of healthy eating may be working its way in. The mango/banana combination sounds delicious. Smoothies are one of my favorite breakfasts during summertime. This sounds so tasty! Delicious. Smoothies are one of the only 2 ways I eat bananas. The other is the rare banana bread. By the way, besides the honey, banana and mango, I also add yogurt and orange juice and a bit of milk to get the perfect pourability. My blender doesn’t handle ice well so I freeze the chunks of mango and then use the straight from the freezer.